He added: “We saw two orange dots rise into the sky and disappear. “A short while later strange lights and colourful, expanding clouds appeared. But an explanation was given - and it had nothing to do with aliens. The display was part of a NASA-funded mission called the AZURE (Auroral Zone Upwelling Rocket Experiment), to learn about the flow of particles in the ionosphere and to find out more about the contribution that an aurora makes to the amount of energy leaving and entering Earth’s geospace system. The ionosphere is the layer of the Earth’s atmosphere ionized by solar and cosmic radiation, located about 75-1000 km (46-621 miles) above our planet. Two rockets were launched from the Andøya Space Center in northern Norway. They measured the temperature and atmospheric density and deployed tracers including trimethylaluminum and a barium and strontium mixture, which ionizes when exposed to sunlight. NASA Wallops Flight Facility, a rocket launch range in Virginia, tweeted: "The AZURE mission successfully launched back-to-back aboard two sounding rockets in Norway tonight. 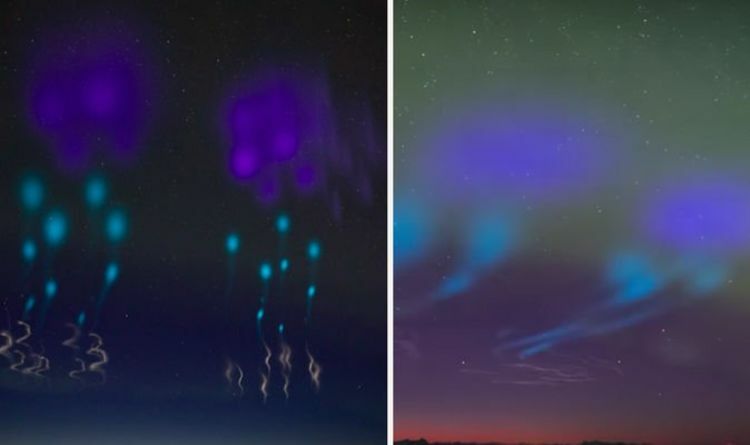 These colourful clouds created a light show in the sky, helping researchers track the flow of neutral and charged particles in Earth's ionosphere." NASA is planning another seven rocket launches in Norway over the next two years, which are likely to cause more rampant alien speculation.